When you are planning an upgrade for your home, trust Flooring America to provide you with the new floors you need. Our showroom houses a number of great surfaces, including beautiful luxury vinyl flooring in Williston, VT.
With luxury vinyl, you have a cost-effective flooring solution that looks great in any room, while providing a resilience that is unmatched by other flooring options. This is why it is such a popular choice for home and business owners alike. If you are looking for a flooring solution that is easy to maintain and provides superior protection against moisture and damage, then luxury vinyl is the right choice. This resilient flooring option is easy to clean, with many spills and messes wiping away simply with a cloth or mop. Vinyl is also hard to stain and is resistant to moisture, meaning it will keep its appearance even after multiple spills and messes. This makes it a great option for moisture-prone bathrooms and basements. This protection also works to prevent water from getting under the flooring, which helps keep mold or mildew from forming. Do you want the majestic look of natural stone? How about the timeless and warm appearance of wood? With luxury vinyl tiles or planks, you can have either of these appearances along with many others. Vinyl tiles are designed to mimic the appearance of natural stone and ceramic tiles. By using vinyl tiles, you also get the extra resilience that vinyl is known for. 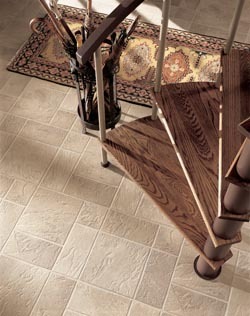 Additionally, vinyl is softer to walk on than natural tiles, making it more comfortable for you and your family. For the natural wood-look, vinyl planks are the option of choice. Designed to look like real wood grain, luxury vinyl plank flooring is a cost-effective alternative to using real hardwood in your home. Luxury vinyl is also considerably easier to maintain and does not require special finishes or polishes to look amazing. After you choose a flooring solution for your property, let our team take care of the installation for you. We have experience with handling all of the floorings we offer and will ensure that your new surface looks great in your rooms. Additionally, by letting our team take care of your luxury vinyl tile installation, you have peace of mind that your new surface is fitted perfectly into your home and that it will last for years.